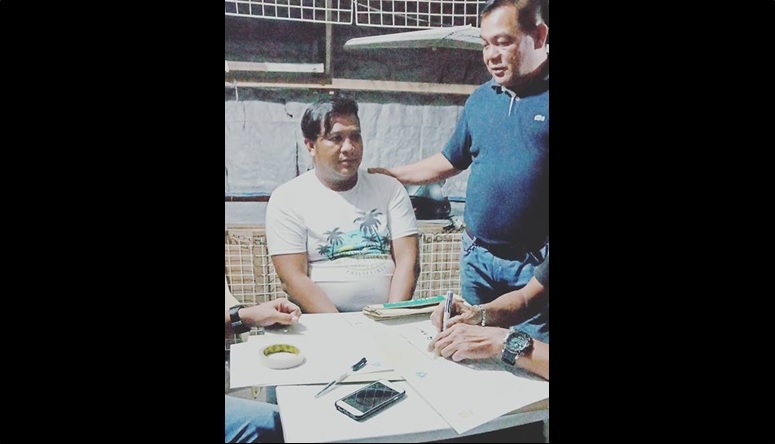 Suspect Ericson Quitalag (seated) looks on as police conduct an inventory of P4.7 million worth of shabu allegedly seized from him outside the Integrated Bus Terminal in Dao, Tagbilaran City on Wednesday night. A composite police team led by a special unit from Camp Crame seized shabu worth P4.7 million from a suspected high-profile drug personality at the Dao Integrated Bus Terminal in Tagbilaran City on Wednesday night. According to Sr. Insp. Romar Labasbas of the Provincial Intelligence Branch (PIB), the drugs were being transported to Tagbilaran City on orders of a suspected “big-time” drug supplier identified only as “Madame” who was facilitating the transaction with undercover police officers through text message. The drugs were being transported by Ericson Quitalag, a native of Angeles, Pampanga, who was arrested by Camp Crame’s Enforcement Unit-Special Operations 5 after he allegedly sold shabu worth P1.2 million to a poseur-buyer outside the Integrated Bus Terminal in Barangay Dao. Labasbas said that Quitalag has been tagged as a high-profile drug personality. However, Quitalag claimed that he was only acting as a courier and was paid P25,000 to transport the contraband. He also said that he was given free travel accommodations on board a Silver Star Bus from Cubao, Quezon City to Tagbilaran and on board a direct flight bound for Manila as return trip. Quitalag was supposed to leave for Manila on Thursday based on his airline ticket, police said. The arrested suspect told authorities that he was not allowed to know details regarding the sender of the contraband as part of their deal. The packs of shabu, with an estimated weight of 400 grams, were concealed inside a brown envelope which was sealed by tape and was handed over to Quitalag in Project 7, Cubao, Quezon City. Police said that the seized packs of shabu were worth an estimated P11,800 per gram. Labasbas noted that Quitalag’s alleged supplier, known only as Madame, was being monitored by police operatives of Camp Crame. However, police have only recently known that Madame was smuggling illegal drugs into Bohol. Authorities have also yet to verify if Madame has long been supplying illegal drugs to Bohol-based drug dealers. Following Quitalaga’s arrest, police speculated that drug suppliers from Luzon and other parts of the country may have been using inter-island bus trips or roll-on-roll-off see routes to smuggle contraband into Bohol due to lesser security in the mode of transportation.